HILLTOP HOODS.. live and direct from Adelaide, Australia. Tuesday, Sept. 8th '09 at Element Nightclub in Victoria. Just back from a Sold-Out Tour of Australia these two Hip Hop Crews unite to tear up Canada from Coast to Coast. Born in Halifax/Enfield Nova Scotia, Classified has defied the odds and found success where others could only hope. Whether signed or unsigned, Classified never abandoned his ethos of working hard and paying ones dues. He has steadily built his career from the independent circuit on up to national prominence, developing into a highly respected MC and desired producer. From his first LP Union Dues in 2001 to the Juno Nominated Boy Cott-In The Industry (2006) and Hitch Hikin’ Music (2007), Classified has sold well over 40,000 records in Canada alone, and has continuously toured the country coast to coast.. Classified's humble and creative approach to his music has garnered the attention of some of Hip Hops top dogs. HITCH HIKIN MUSIC produced by Classified features guest MC collaborations with Tash from Tha Liks and Maestro Fresh Wes. Performances along side Global artist like Nas and The Wu Tang Clan in 2008 set Classified up for his most important adventure yet; Self-Explanatory. April 2009 marked the release of the Classified’s 11th studio album and major label debut. 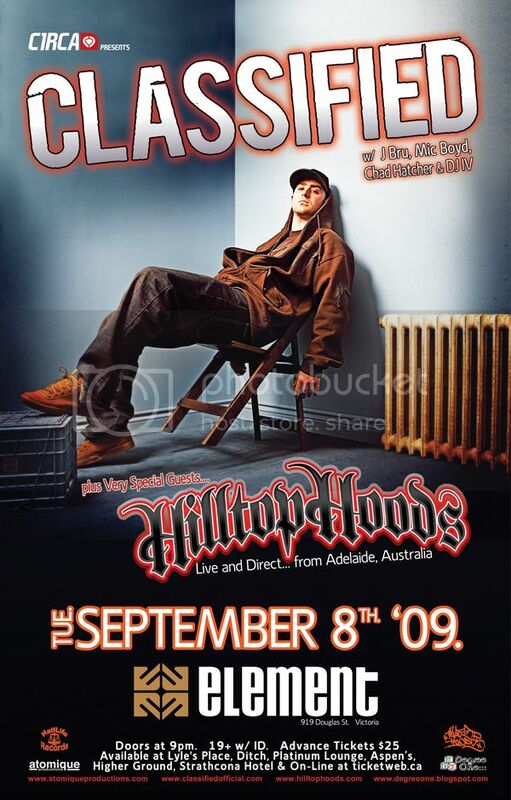 Self Explanatory showcases Classified’s many sides; fun and playful at times yet perceptive and insightful at others. Touching on personal matters (relationships), hip hop issues (past, present and future) and life itself, Class relates with an honesty that truly connects with people. Self Explanatory includes the collaborations “One Track Mind”, a cut penned with celebrated East Coast rocker Joel Plaskett, centered around a Beck-esque piano run, recorded in Joel’s home studio, and “They Call This (Hip Hop)” with Royce 5’9” and much hyped MC B.O.B from Atlanta, that challenges the assumption that hip hop influences people in a negative way.Self Explanatory continues to call-out Canada’s A-list artists with appearances by Royce 5’9”, Joel Plaskett, Choclair, Moka Only, Mic Boyd, Chad Hatcher, Shad K, Saukrates, DL Incognito, Buck 65 and D-sisive. The crew are singled out among Australia’s hottest live acts by press, industry insiders and fans alike. They just completed a sold-out national tour of Australia w/ Classified and standout festival spots at Big Day Out, Splendour In The Grass and The Falls festival have confirmed their local drawing power, while performances at London’s Shepherds Bush Empire and Berlin’s Popkomm have proven they can take their sound to the far corners of the globe. With forthcoming spots at prestigious international festivals including Glastonbury and Canadian Music Week, the horizons are ever expanding for this powerful trio. The Hoods new album 'State of the Art' debuted at #1 on the ARIA Album Chart ! ‘State of the Art' not only debuted at #1 but also achieved Gold Sales status in the first week ! On top of that, it's the fastest selling Australian album this year. Advance Tickets are just $25.